(Flute/Piccolo, Clarinet, Violin, Viola, Cello and Piano). Commissioned in 2010 by Lunatics at Large, for The Sanctuary Project. One movement work. 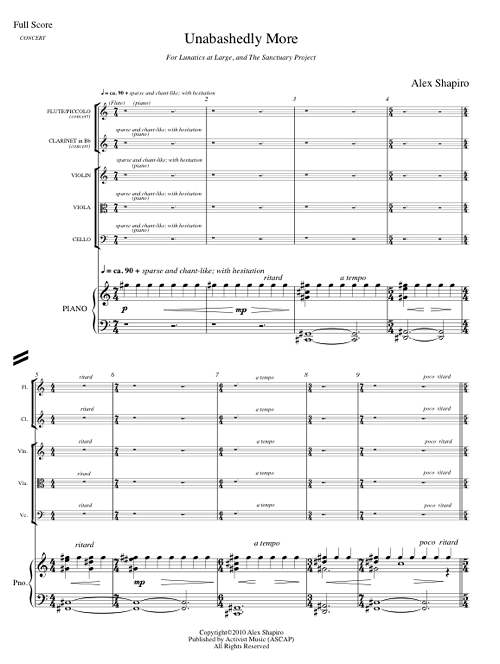 38 pages (score), 8.5" x 11". Premiered on March 21, 2011 in New York, NY. by Lunatics at Large: Jonathan Engle, flute; Ben Ringer, clarinet; Arthur Moeller, violin; Jen Herman, viola; Andrea Lee, cello, and Evi Jundt, piano. Audio clip performed by Lunatics at Large, live in concert at Synagogue for the Arts, New York City, April 2011. 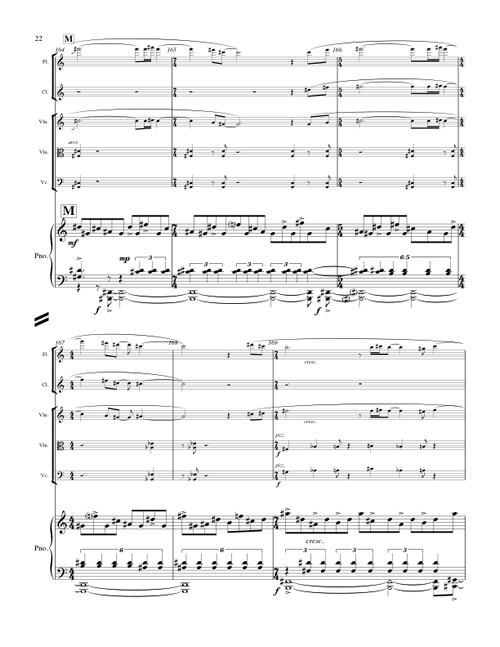 Score and parts for Unabashedly More are available from Activist Music for $50.00 print; $35.00 digital. I loved the concept of The Sanctuary Project the moment Lunatics at Large pianist Evi Jundt described it: artists reflecting on their impressions of what "sanctuary" means to them. A private thought, brought to the public forum of performance. There are many places in which each of us finds sanctuary, and for me the most frequent, and certainly the most reliable, has been in the act of composing. This is where I've always been safe. Safe enough to express aspects of my otherwise cheery personality that might not be considered socially acceptable, were I to blurt my inner rage, or laugh uncontrollably, or sob, in the midst of, say, a cocktail party. The protective confines of the manuscript paper allow me an emotional freedom, as do the welcoming ears of audiences who are prepared--eager, in fact--to receive whatever the notes on those pages communicate, whether thornier, funnier, or more disconsolate. But "Unabashedly More" falls on the other side of the emotive spectrum. These notes find their sanctuary within beauty and lyricism, and sometimes, within great simplicity inspired by the natural world that surrounds me as I compose on San Juan Island. Melancholy floats through the piece until the final measures, which then unabashedly state my feelings of tremendous excitement toward the world around me, despite its challenge. Through this piece, I can share a very special sanctuary with anyone willing to listen, and reflect back to them their own joy and wonder. ""Unabashedly" accomplished something that few composers or pieces of music can: it's music that defies gravity." Shannon Delaney, viola; Aude Castagna, cello; and Ben Dorfan, piano. (Flute/Piccolo, Clarinet, French horn, Violin, Cello and Piano). (Flute/Piccolo, Violin, Cello and Piano). Commissioned in 2006 by Chamber Music Palisades. One movement work. 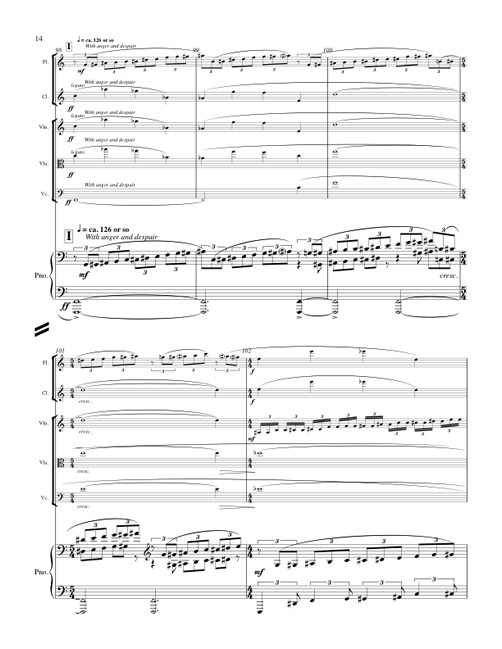 25 pages (score), 8.5" x 11". Premiered on May 9, 2006 in Los Angeles, CA. Peter Stumpf, cello, and Delores Stevens, piano. Audio clips excerpted from the live premiere, May 9, 2006.